In his latest hit piece on the Oakland Raiders, our favorite Sports Illustrated writer—the one who penned the widely panned “story” about Eddie DeBartolo and Carmen Policy potentially buying the Raiders—ranks Mr. Davis 25th in his evaluation of NFL owners, down in the dregs with the likes of the Bidwills and Yorks. Guess who ranks 22 slots higher? Daniel "Money for Nothing" Snyder of the Redskins. Talk about intellectual gymnastics. Take this guy's pen away before he hurts himself. "Raiders chief executive Amy Trask says her boss, who turns 77 on the Fourth of July, "is as vital and vibrant as ever." Unfortunately, his franchise is in ICU, with dubious talent and a miserable stadium situation made worse over the years by lawsuits, Davis' aversion to marketing (because, after all, they're the Raiders, and everybody loves them) and an initial miscalculation of a once-rabid fan base's collective fervor. The good news is that Davis cares about nothing besides the Raiders; the myth, however, is that he wants to win at all costs. That fallacy was exposed when Marcus Allen mysteriously disappeared on third downs and in goal-line situations in the early '90s, and it suffered another blow when Davis decided not to try to extend Jon Gruden's contract after the coach led the team to the AFC Championship Game in his third season." Of course, our author neglects to mention that the Raiders went to the Super Bowl in the season immediately following Gruden’s eventual departure. He neglects to mention this because it disturbs his worldview. You see, Mr. Davis is an all-powerful meddler when things are going bad for the Raiders, but a mere pawn of Jon Gruden when things are going well, and Bill Callahan’s team was actually Jon Gruden’s team, even though the great Jon Gruden was on the other sideline during that Super Bowl, coaching his team, not Tony Dungy’s team. You got that? Check out Raider Raza’s compendium of praise for Mr. Davis—does this sound like one of the worst owners in the NFL to you? Mr. Davis helped pioneer the AFL-NFL merger, assembled some of the greatest football teams in NFL history, racked up three Lombardi trophies, blazed executive trails in both race and gender, was elected to the Hall of Fame and won the AFC West three times in this decade. Yet he is one of the worst owners in the NFL? Don't tell me that the past doesn't matter—you're the one who brought Marcus Allen, and thus the past, into this discussion. It’s particularly ironic that, while dissing Hall of Famer and law-abiding citizen Al Davis, our author writes love letters to convicted criminal and NFL pariah Eddie DeBartolo. And what’s this about an aversion to marketing? Once the Raiders got control of their own ticketing operations this year, they began marketing the hell out of season tickets. They’ve gone so far as to assign a personal service representative to each season ticket holder. Click here to read comments from myself and others about the success of this new ticket marketing approach. Additionally, the Oakland Raiders consistently rank in the top five in NFL team merchandise sales. How can you achieve such a distinction without, at some level, being a savvy marketer? P.S. Thanks to Mad Stork 83 for tipping us off to this piece. I recently suggested that the Raider Nation turn up the mockery volume on those who would presume to thieve the word "nation" from its rightful owners. Well, allow me to twist the knob by directing you to the Kansas City Chiefs web site, where they declare the existence of a "Chiefs Nation" right at the top of the home page. Worse yet, the site is built around a weird abominable green hue that has nothing to do with the team's colors, and in fact seems designed to specifically clash with the team colors. Somebody needs to check the water supply out there, because something is definitely wrong in "Chiefs Nation." P.S. Horsecollarjack noted that the Chiefs fans at the top of the team web site are doing strange things with their hands. I suspect it's their version of the tomahawk chop popularized by Atlanta Braves fans? At this rate of ripping off other teams, it's only a matter of time before they put cheese on their heads and pig snouts on their faces. 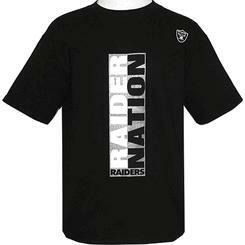 Building upon my previous take, I select the new Raiders Max Attitude Nation T-Shirt as Gear of The Week. This shirt acts as kryptonite for the Raiders fan, smiting the “Bronco Nation” and all of those other weak unoriginal fan bases that would presume to thieve our identity. Imitation is the sincerest form of desperation. In the Raider Nation, we accept no imitation. Bonus Gear: Celebrate John Madden's election to the Hall of Fame with the 2006 Enshrinee T-Shirt. Thanks to John at The RaiderCast for suggesting this gear. While you're shopping at the HOF store, you might as well get yourself a fine headshot of Mr. Davis. The proliferation of the word “nation” is getting tiresome. Steeler Nation. Bronco Nation. Clipper Nation. Blah, blah, blah. In his Raiders blog, the Analyzer makes a good argument that imitation is the sincerest form of flattery. Nevertheless, I think we should turn up the mockery volume until it stops. The mainstream media are a big part of the problem, suddenly calling every fan base a “nation.” Well, there is one “nation” in the sports world, and it’s the Raider Nation. 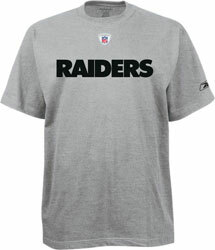 Reebok, official keeper of NFL gear, has long made Raiders apparel referencing the “Raider Nation.” Why? Because "nation" is an established phrase describing the fans of one NFL team, and that team is the Raiders. It's like "cheesehead” for the Packers fan, just cooler. Come to think of it, Bronco Cheeseheads has a nice ring to it. Don't tell me that "nation" is a generic term, and is thus applicable to any fan base. Don’t call your fast food stand “Burrito King” and tell me you’re not ripping off Burger King. Another regrettable trend in the media is the arrogant dismissal of “the fan.” The so-called experts seem to be getting more and more defensive these days as blogs, podcasts, email, cell phones and other newer technologies have given fans a voice like never before (If you’re over 30 years old, you remember the day when your voice was limited to a handwritten letter to the editor). Listen to Randy "Raiders Hater" Cross and some of the other guys on Sirius NFL radio and you’ll get pure dose of the arrogance of which I speak. I hate to say it, but George Atkinson has been a perpetrator of this attitude on the homefront (click here and here for a taste of George’s sins). You haven’t played the game! You just don’t understand the nuances! Don’t believe your eyeballs, Kerry Collins is a great quarterback (who still hasn’t found a job in the QB-starved NFL)! Hey radio guy, if you don’t want to hear from us, don’t answer the phone. The fan is on the rise, armed with rollover minutes and bandwith, like it or not. Deal with it. I found a cool web site that documents football helmets through the ages. According to this site, the Raiders last modified their helmet design in 1964. Most teams have modified their helmet designs—from the minimal to the drastic to the truly hideous—within the past 10 years. To me, this is just more evidence of the timeless brilliance of the Oakland Raiders, and a clear case of not messing with perfection. I love nothing more than a righteous tailgate on the Coliseum asphalt with my cousin and the Raider Nation. However, I now realize that I may have been taking my tailgates for granted. In its 2006 NFL Preview magazine, Athlon Sports has a feature on tailgating, with details for each team. I was stunned that several NFL teams apparently have no on-site tailgating. Take St. Louis: “All parking within one-mile radius. All are private lots; no stadium parking; shuttles provided.” You call that football? Or Jacksonville: “Few stadium spaces for visitors; park in city and take shuttles. All must call to reserve a spot.” Is this a restaurant or a football game? Or Detroit: “All public parking handled by private companies…Get spaces in advance from city’s Parking Department.” Or Cleveland: “Stadium doesn’t offer parking. Best bet, nearby Port of Cleveland parking lot.” Or Seattle: “Parking limited due to location…No alcohol.” What!? Red meat and cappuccino? I now have a renewed appreciation for hanging out in the immediate shadow of the Coliseum, cold one in hand, no reservations or shuttles required. I felt in the presence of greatness when the Raider Nation responded so vigorously to Species of The Raider Nation last Friday and throughout the weekend. More than 60 commentators have so far recorded their testimony of how they became a Raiders fan, and I am in awe of their stories. We have an eight-year-old girl getting pissed off when Heidi interrupted the Raiders v. Jets game. We have a native of Sri Lanka kneeling in prayer to help guide George Blanda’s field goals. We have a kid digging through trash bins in search of a Ken Stabler newspaper photo. We have sons initiating mothers in the Raider Way—and vice versa! We even have someone who was a Raiders fan “incarnate” before being conceived by his parents. We have it all. If you haven’t read these stories yet, I urge you to do so—you won’t be disappointed. Every story is unique, and yet there seems to be a common thread that runs through them all, a passion that defies explanation, a dedication that remains unshaken, a loyalty not only to a team, but to one another, culminating in the inimitable cultural phenomenon known as the Raider Nation. Perhaps we can keep it going? If you haven’t done so already, please tell us your story. If you know a Raiders fan, email them and invite them to participate (click on the email icon at the bottom of the take). This is an open-ended take, a virtual family album for the Raider Nation. I plan on posting it under Most Popular Takes, so that it will be easily accessible to future visitors. It would be cool to rack up 100 testimonies. Special thanks to RaiderNews.com, Raider Nation Podcast, RaiderFans.net, The Raider Cast and RaiderWorld.net for spreading the word about this take (if I inadvertently left anyone out, let me know and I will add you—I apologize in advance). Thanks to Raiderdecoachella for instigating this take. And thanks again to all of you—present and future—who grace these pages with your comments. How did you become a Raiders fan? Were you born with a silver (and black) spoon in your mouth? Or were you born again, cleansed of past sins such as rooting for the 49ers? I believe that the Raider Nation is not only a family, but also a genus, and within each genus there are species. This belief was sparked by Raiderdecoachella (a.k.a. Miguel, father of Michael Raider), who planted the seed for this particular take. He has a great story about how he became a Raiders fan. And so I ask: How did you become a Raiders fan? What species are you? Please refer to my Naturalist's Guide to The Raider Nation below. Identify yourself by species, and tell us your story (click here for my story, I'm an inheritor by species). Keep it short and sweet if possible, and let it rip in the comments section. I look forward to your testimony. The inheritor grew up in a Raiders household, mentored by a father and/or older brother (or mother or uncle, etc.). The Raider Way was passed down to you. You may have strayed, but never far. And now you are doing your forefathers proud, and possibly nurturing a third generation in matters of pride, poise and excellence. This is like prison, but with a happy ending. You didn’t have any mentors. You got started early. It was something innate, of your own volition. It grew over time. Pretty soon, you were in it for life. You really didn’t have a choice, did you? Were you raised in a sea of red and gold or blue and orange, only to find your true calling in the Raider Nation from day one? The Silver & Black sheep merits specials praise, as he or she has snubbed the peer pressure of friends and family, all in a commitment to excellence. Even in places like Denver and Kansas City, these black sheep strut confidently about town in their Raiders gear, unpopular yet righteous, like missionaries in hostile territory. Unlike being a traitor, there is no shame in being a “traider.” A traider is someone who, for whatever reason (dysfunctional family, bad influences, geographic insulation, substance abuse, etc.) once rooted for a lame team such as the Dolphins or Chargers before seeing the light. Do not look back, traiders! Do not make excuses. Your sins are forgiven. Who cares if you think that the Mad Bomber is Ted Kaczynski and that Frenchy Fuqua is a type of coffee? You’re a young or newer football fan, and you’ve decided that the Oakland Raiders are your team, and that’s all that matters. You don’t need to be an expert to be a fan. Citizenship in the Raider Nation is free, no questions asked. Knowledge will come in time. It's the heart that matters. Have you given up on the Raiders? If so, why are you reading Raider Take? I know why: because you haven’t really given up. Sure, you’re still bitter about the move to Los Angeles, or the PSLs, or something else. Well, just give it some more time, and keep hanging around these parts. You’ll look in the mirror someday, at that Steelers or Panthers hat atop your noggin, and realize that you’ve been living a lie. You still bleed silver and black. You’ll be back. You know the door is always open. It is a magnificent piece of fine art. Picasso was a scribbler in comparison. I later discovered that this painting is echoed on the cover of the November 1976 issue of Eerie Magazine. It’s a proverbial chicken-or-the-egg question: Which came first? Was the painting modeled after the magazine cover? Or vice versa? If you know anything about the origins of this masterpiece, please let us know. Eerie Magazine specialized in fictional stories of the monstrous and bizarre. According to this site, the cover artist for this issue was Ken Kelly. 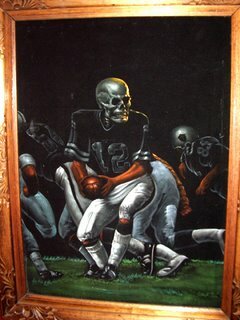 Could that be a Ken Kelly original at Everett & Jones? If Ken Kelly is indeed the one who conceived this particular image, then I declare Ken Kelly an artistic genius. P.S. The headline for this Eerie issue was: “HE WAS DEATH ON CLEATS!” Sounds like a biography of Kerry Collins to me. P.P.S. Click here to purchase a poster of the Skull Stabler magazine cover. The Analyzer is going to put one in his living room. Gigi Gillard of the Oakland Raiders Ticket Office sent a note to Raider Take the other day, kindly requesting that I help spread the good news about season tickets. It got me wondering: Why haven’t I written more about this? Perhaps I got distracted by my duties as the executive director of the Paul McQuistan Haiku Fest. While I’ve mentioned the new ticketing improvements in passing, I haven't yet done them full justice here at Raider Take. So now I want to make up for lost time by elaborating on both recent developments and my own personal experience with the new ticketing operation. Let me begin by saying that I would never measure the dedication of a Raiders fan based on how many games he or she attends. Everyone has their own personal, financial and geographic considerations that affect their ability to attend games. I respect these considerations. However, if you’ve toyed with season tickets in the past, only to be crushed by the senseless added fees and spit-in-your-eye customer service of the now-defunct Oakland Football Marketing Association, here’s the really good news: tickets are considerably cheaper, and the customer service immensely improved, since the Raiders began handling their own ticket sales this year. Perhaps this isn’t news to you, but the folks at the Oakland Raiders Ticket Office report that, in fact, many Raiders fans are still unaware of the depth of the recent improvements. The new ticket plans are models of simplicity. Click here to view the pricing diagram. Just multiply the price by 10 (eight home games and two preseason games) and you have your total season ticket cost. I recall that there is a negligible $2 up-front service charge, but that’s it. There are no taxes or hidden fees. The dreaded Personal Seat License has been eliminated. No weird math or head scratching. You simply pay for what you get, one year at a time. You will immediately notice that, in most cases, the savings are big compared to the packages of previous years. Packages now start at just $260 ($26 per game) for the season! Yes, these cheap seats are atop Mt. Davis, but you can't beat the price. In my book, some of the best values are found in the middle price range of $610, on the first and second levels around either endzone. That’s not chump change, but it’s money well spent if you can swing it. If you, like me, believe that the Return to Glory is well underway, then there is an additional advantage to owning a personal piece of Coliseum real estate for the entire season: first priority on purchasing playoff tickets. My guy at the team’s ticket office was Jhmichea (pronounced Ja-MIKE-uh) Snyder. I’m a careful investor and a tire kicker by nature, so I’m afraid I practically drove poor Jhmichea nuts trying to find just the right seats for my cousin and myself. Over the span of several calls, he provided me with various options until I was satisfied with my choice. He was friendly and responsive on all occasions, as were his colleagues, including Tom Ybarra. I encourage you to call Jhmichea, Tom and friends toll-free at 1-800-RAIDERS. Shoot the breeze with them, kick some tires, and see what they can do for you. Or sign up here to get more information on both season and individual game tickets (individual game tickets go on sale in July). If you want to daydream or test drive your potential seats, then check out the cool new Coliseum virtual tour tool. Ultimately, I believe that what was once a pipe dream for many—a season ticket package—is now within reach of many, given the improvements in affordability and customer service. It’s what the Raider Nation deserves, and it’s been a long time coming. A new day is indeed dawning at the Coliseum in 2006. P.P. 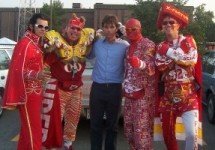 S. I know that for some existing season ticket holders in certain locations, the price has gone up, and I understand if there's some bitterness with that. But in general, and for the greater good, I believe that the elimination of the PSLs and the improved customer service are a step in the right direction. The new plans are more inclusive, with cheaper options and no punitive seat licenses. This ensures that no Raiders fan is left behind, which is an important factor in filling seats and keeping the team in Oakland. P.P.P.S. If you are a new Raiders fan and have never been to a Raiders game but are curious about attending, then test the waters with an individual game ticket—you will be embraced by the Raider Nation and inspired by the environment. For an extra nudge, click here for Raider Take’s description of the gameday experience. This is getting a bit creepy. The author of the bogus Sports Illustrated piece about Eddie DeBartolo and Carmen Policy raiding the Raiders is back…with a bizarre “open letter” to Denise DeBartolo York! At this rate, Eddie might need to consider a restraining order. Back to Eddie for a moment: You may have seen my story in last week's SI -- or perhaps you've read some of the reaction pieces, many of them irresponsibly reported, in which a quote from your brother expressing his desire to get back into the NFL, and even pondering the idea of buying the Raiders and moving them to L.A., is somehow proven to be "wrong." My initial thought: Denise reads Raider Take? Cool. Thanks for Jerry Rice. As for our author, it sounds like he doth protest too much. Neither Raider Take nor the others said that Eddie’s wild NFL fantasies were proven wrong (a fantasy, by definition, cannot be proven wrong). We said that reporting these fantasies as viable was wrong. We said that minimizing Amy Trask’s rebuttal was wrong (as reported in the San Francisco Chronicle: “Sports Illustrated, in all fairness, did contact Raiders CEO Amy Trask for comment. Unfortunately, Trask says, the magazine omitted much of what she had to say in response.” In all fairness, of course). We said that invoking Al Davis’s physical health to support a false premise was wrong. DeBartolo, 59, says buying the Buccaneers would be his first choice. (He looked into purchasing them three years ago but was rebuffed by owner Malcolm Glazer.) But he and Policy -- they had a falling out shortly before DeBartolo left the 49ers but have repaired their relationship -- have contemplated other teams, including the Saints, and their interest in the Raiders is piqued by whispers that Davis, 76, is ill. He has been using a walker because of a leg ailment and did not show up at February's scouting combine or a recent minicamp. "For Al Davis to miss the combine, that's unusual," DeBartolo said. However Oakland plays out? She just told you nothing is playing out. In other words, more credibility is given to the insupportable idea of convicted criminal Eddie DeBartolo preying on an allegedly feeble Al Davis than CEO Amy Trask confirming that it’s a bunch of bunk. Finally, there's Carmen Policy himself, stating to the Oakland Tribune: "There's no chance of it happening, and we never really talked seriously about it." If there’s no chance of it happening and they never talked seriously about it, then why treat it seriously in the pages of Sports Illustrated? Or, if you contend that Carmen is now lying, then save your ire for him, not us, and remember not to use liars and crooks as sources for future stories. And most of all, remember that when you take irresponsible swipes at the Raider Nation, don't be surprised when the Raider Nation hits back. P.S. Thanks to Mad Stork 83 for tipping Raider Take off to the "open letter."